Every spring, the forests of western Montana and I have a standing date. Planning begins almost a year in advance, as I keep an eye on the sky and my nose to the wind, waiting to find out...Where's the fire? Because a fire there will be; it's almost guaranteed. Drought conditions are a pretty reliable condition of summers here, especially in the last dozen years or so. Besides, fire is a natural part of a healthy forest ecosystem, and a routine occurrence here in the semi-arid west. My nose starts twitching round-about July, because where there's smoke there's fire, and where there's fire there's mushrooms. Theories abound regarding why morels grow in burn areas. As there seems to be no consensus on this issue, and any speculation leads us far into the depths of fungal physiology, let's just suffice it to say that the year after a medium-to-high intensity forest fire, you can expect to find a bumper crop of the illustrious Morchella species. Folk wisdom tells us that the morels start fruiting when the Bluebells (Mertensia) are in bloom--depending on elevation, anywhere from May to early July. Everything about morels rests on a fine balance. You need enough rain, but not so much they rot away. Enough warmth, but preferably overcast days. Enough fire, but not scorched barren earth. The hunt for a perfect spot rests as much on intuition as it does on preparation. Here's a bit of what I've learned over the years. 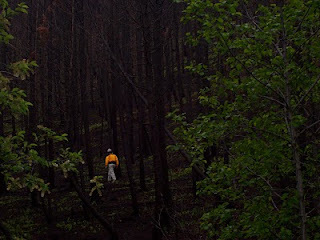 Fire morels will continue to pop up the second and even third summer after the burn, but it pays to get right in there. Around here, it's no secret that recent burns harbor fungal treasure troves. 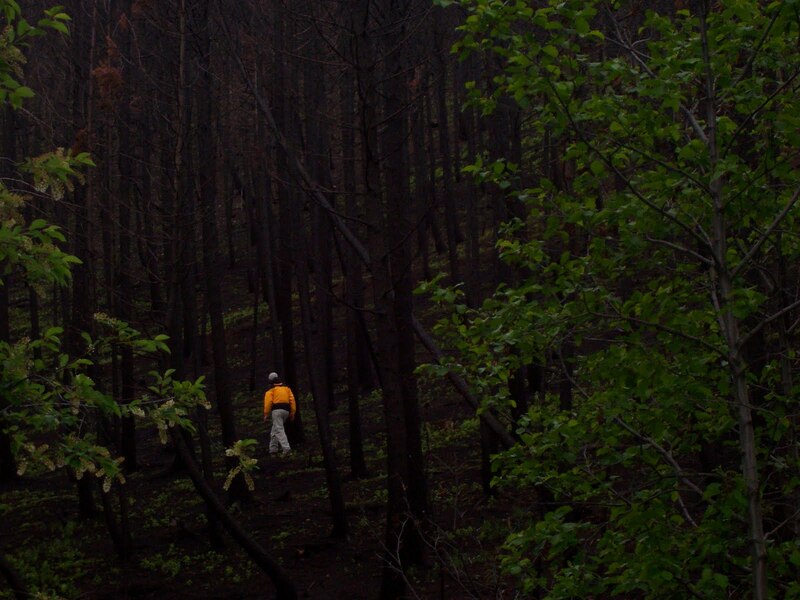 Burns in easily accessible wilderness areas will quickly be overrun with pickers (and there's nothing more disappointing than stumbling on a prime patch, only to find footprints and stem-nubs). You either have to get up there early, or be willing to hike the long haul and boldly go where no picker has gone before. Last year, I just had a near-vertical climb and this thunderous river crossing between me and super-secret mushroom paradise. Had a hard time walking the next day. Worth every penny. No mushrooms here. Too toasty. I head for water (usually as simple as looking for deciduous shrubs in a forest of scorched conifers) then prowl the edges. The ground is spongy, slick, black, often covered in a layer of needles. The smell of ash and pine is intoxicating. both of which are potentially toxic. Best not to mess around with questionable fungi, as a good general rule of thumb. This goes beyond the good practice of giving other pickers their space. It's a harvest, not a raid. There are a few simple techniques to ensure the patch you pick will keep producing in the future. Never rake forest litter in search of buried mushrooms; this disrupts the soil and results in overharvesting. Pluck the mushroom off just above soil-level (with your fingers, not a knife! ), so as not to disturb the mycelial mat underground. Don't pick really tiny mushrooms. Tread lightly; compaction can be devastating to burn areas, especially when the soil is wet. The goal is to cultivate future mushrooms by protecting the mycelium and encouraging spore dispersal. You can scatter spores by using baskets to collect (as opposed to buckets or bags), and by leaving big gnarly specimens where you found them, free to live out their old age throwing spores to the wind. Rules, rules, rules. 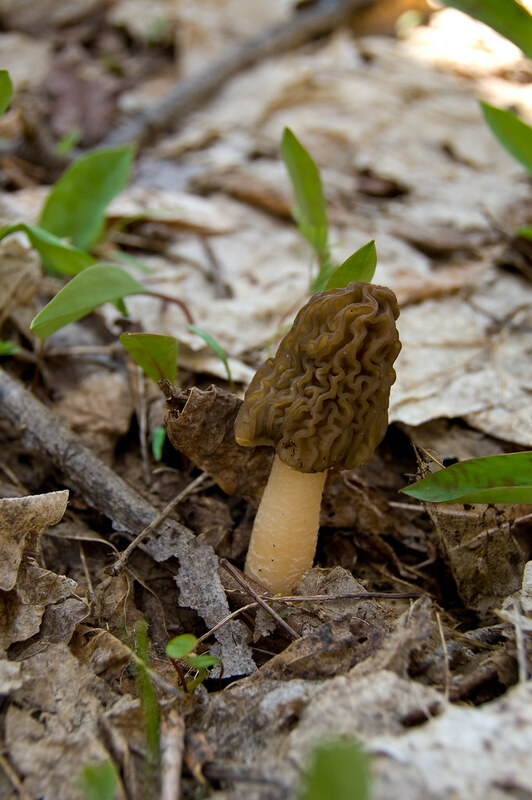 Morel hunting is so popular, there are a whole slew of regulations to keep it from running amok. The rules vary according to region. You'll definitely need landowners' permission, and you might need a permit on state land. Last year, I got a free recreational permit from the Bitterroot National Forest offices, which allows us 5 gallons per day per person, up to 20 gallons for the season. There are fees and different regulations for commercial permits. To be honest, the thrill of the treasure hunt is the real reason I do this. For me, finding the little camouflaged jewels in the burnt rubble far outweighs the feast that awaits. But yes, they're delicious and earthy and wild-tasting, a forest delicacy teetering between primitive and oppulent. Share them with friends. It somehow improves the flavor. Hill's Morel Mushrooms has a great summary of how to process and store your harvest. Also visit this super-handy Inciweb site to follow active burn areas. 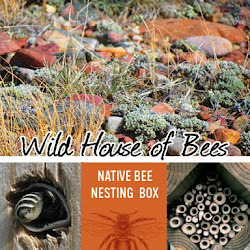 This blog post was originally created for the Montana Natural History Center. Click here to read the original post. And with that, this stinky picker is beat. Happy hunting to you all!